We’re getting closer to the release of Pokemon Sun and Moon. I just completed the Unova region. Only one more region to go before getting Alola! When this game first came out, I remembered how amazed I was at the graphics. I got the game for Christmas and once my family had left after the holiday, I laid in bed and began to play. I loved how the Pokemon moved during the battle as it felt more realistic. The sprites were still that–just sprites. But the colors were brighter and everything in the game, battles and walking around the routes, just seemed livelier and more colorful than the other games. As always, the controls for this game are just like the other Pokemon games. There’s no button-mashing to be had and all the buttons are straight forward and only have one function throughout the game. Being a Nintendo DS game, I still very much love the function for the touch screen during the Pokemon battles and even outside the battles. 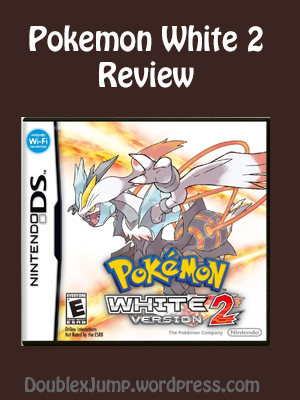 I was skeptical when I found out there were making Black 2 and White 2 as opposed to a “Gray” or a “Rainbow” to the original Black and White games. I found it odd there would be four games as opposed to three and there would be no “final” game to a “trilogy.” Yet, I thought they did a great job at continuing Black and White’s story. I know most people weren’t a fan of Black and White, but I think Black 2 and White 2 made up for it. The Unova region isn’t my favorite. It’s kind of hard to explain why, but I always had a tougher time getting through that region than the others. The games are still great, though. I love the new Pokemon designs (even though they got a lot of hate), and I didn’t mind the “sequel” aspect. Still, I didn’t have as much fun as I did the other games.